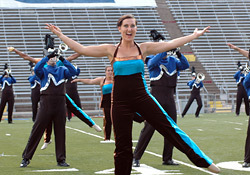 All-age corps from across the country will gather in Rochester, N.Y. over Labor Day Weekend, Aug. 29 to 31 for the 2008 Drum Corps Associates (DCA) World Championships. More than 50 organizations are scheduled to participate in the three-day series of events. Each summer, several all-age corps have the opportunity to perform as part of the Drum Corps International Summer Tour. In June during the DCI Madison event at Camp Randall Stadium in Wisconsin, DCI.org's David Rhodenbaugh caught up with Minnesota Brass drum major Jenny Reach and Kilties drum major Guy Gregg to learn more about all-age drum corps and how they compare and contrast to the junior corps of Drum Corps International. Many members of DCA groups made their drum corps starts as members of DCI units, some are current DCI corps members, and still others like 19-year-old Reach, began their drum corps careers in all-age groups aspiring to one day participate with a DCI corps. Listen to the interview. (MP3, 3:00, 2.74 MB) The '08 DCA World Championships kick off Friday, Aug. 29 at 5:30 p.m. with the Individual & Ensemble competition followed by the Mini Corps contest at 8 p.m. The Championships will culminate on Sunday with the Alumni Corps Spectacular. View a schedule of all events and more about the DCA World Championships at DCACorps.org.